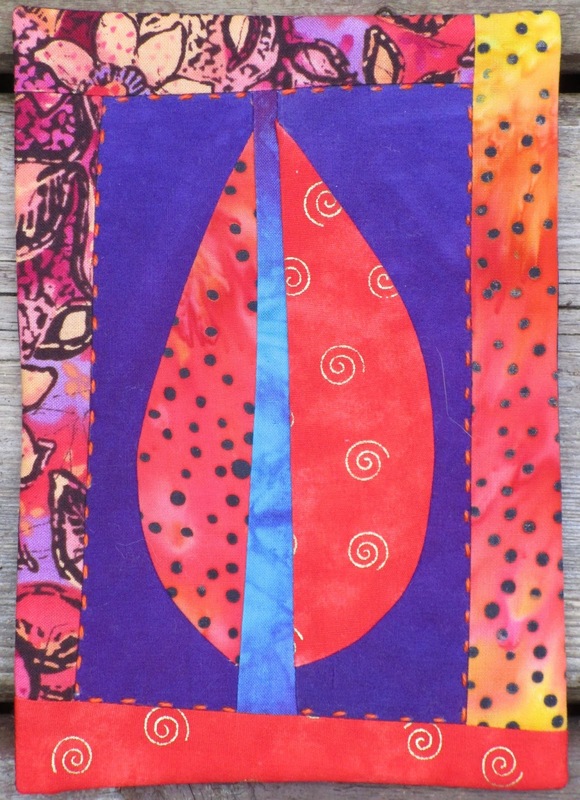 I've been thinking lately about quilting retreats, and especially about the three night, four day retreat a group of us have at Honeymoon Bay every March. Before Honeymoon Bay it was at Tamagawa and before that is was at Montfort House. It's been a tradition for more than twenty years now, and although the configuration of people has changed over the years, it remains one of my favourite times. Each of us carts in enormous amounts of fabric and thread, and all the sewing machines and equipment we need to work on whatever project (or two or three) that we've brought with us. It's almost always more than we need, and some of us need help these days getting it from our vehicles to the classroom workspace, but then we begin. There's always a challenge to participate in and at least two evenings when we share our work. And throughout the day there are delicious meals served to us by the staff. And then at the end of the day there's a hot tub to soak in before falling into the comfiest of beds. I feel so, so fortunate to have each and every one of these women in my life - women who share the same passion for the making of things - and who choose to spend time together every year. And it just seemed the right thing to write about this week. Today is Day 96 in the 100 Day Challenge I've been participating in since January 1st. So I'm almost there. I'm having to put all my energies into getting the last few pieces made, and to be firm with myself in not working on anything else until they is completed. For now I must content myself just thinking about and sketching other possible creative endeavours. So in that vein, I am choosing to share a few of my most recent compositions here. 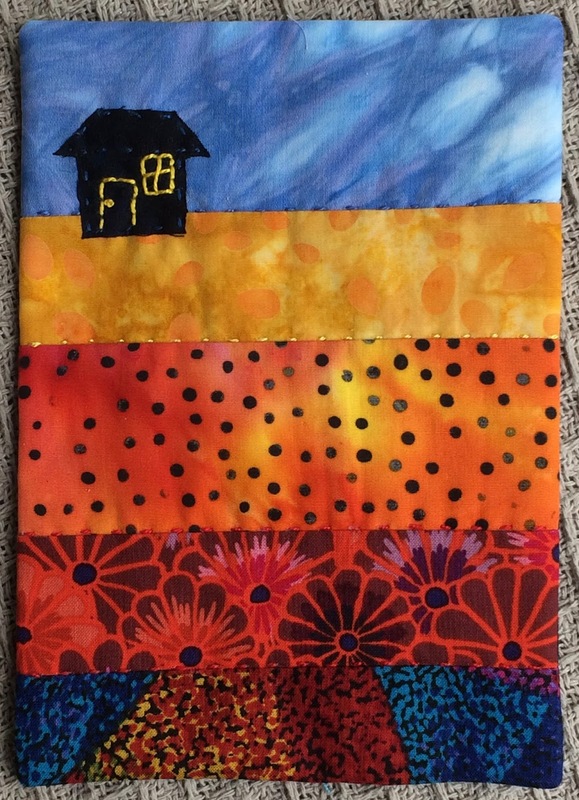 It will probably come as no surprise to those of you who know me, that I have used the bright coloured fabrics I have always enjoyed working throughout this project. Every once in awhile I tried to work with more subdued colours, but they never give me quite the same satisfaction. 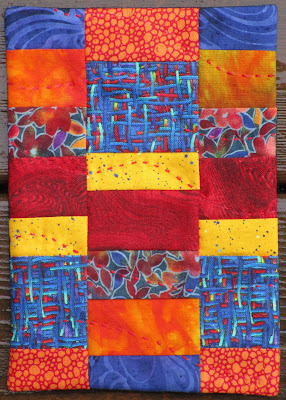 And I've considered using solids at times, but I realize that it's the texture provided by prints that I love. 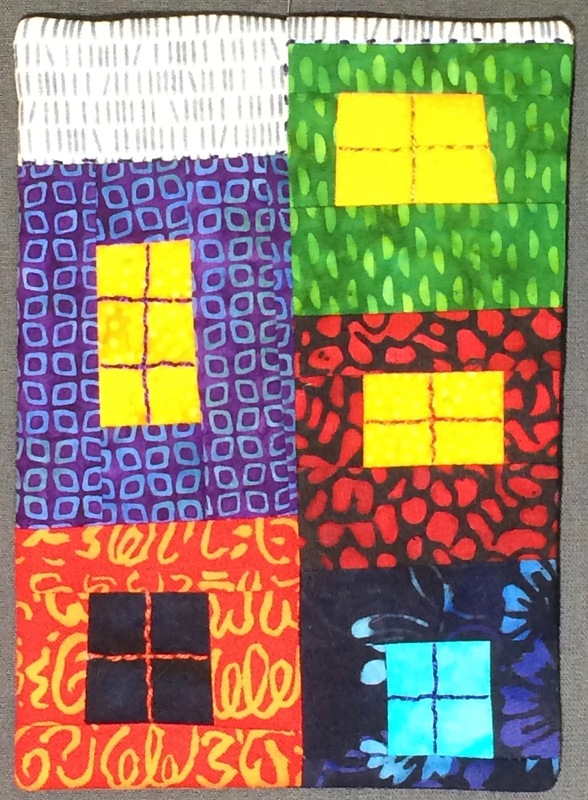 A few of these daily pieces suggest expanding them in larger work, like this one with the yellow door. There is something about this one that really pleases me. And the leaves will most certainly be making another appearance again. I do love their rounded shapes. And the trees too will reappear, of that I feel quite certain. Adding hand-stitching to all my work has become part of my practice, and possibly the part I enjoy most. 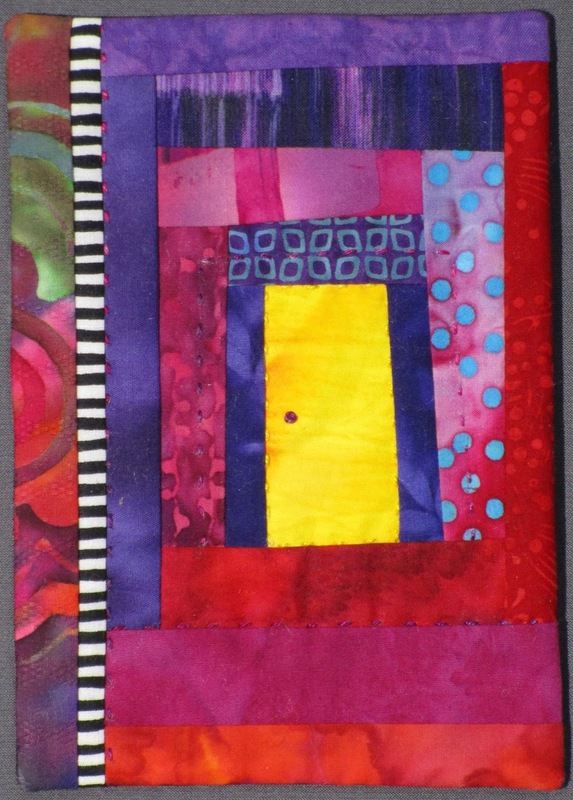 I so love holding it in my hands as I needle through the layers. 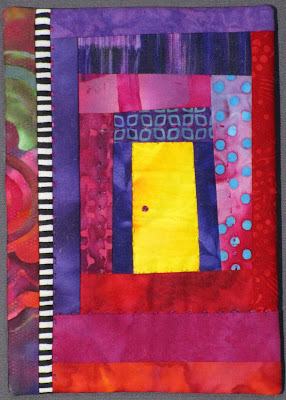 And all of these small compositions include at least a little hand-stitching. It's been a terrific experience taking part in this challenge, and I'm thankful to the Ladysmith Waterfront Gallery for sponsoring it. What fun it's been to follow the Facebook page on which all the participants have been posting their own results, results that have encouraged me and prompted me in ways I had not anticipated. So good to be in the company of other artists, who are trying out new things and learning more about the work they want to make in the process. This is the life I want to lead and where I want to be and what I want to be doing, and I am overflowing with thankfulness that I'm able to do this very thing. "Art is Restoration . . . "
"Art is restoration: the idea is to repair the damages that are inflicted in life, to make something that is fragmented - which is what fear and anxiety do to a person - into something whole." I had this moment of recognition - oh these are the words to explain why I do what I do. Something to do with putting things back together, of making sense from what often feels random and chaotic. Making a whole from the broken bits. 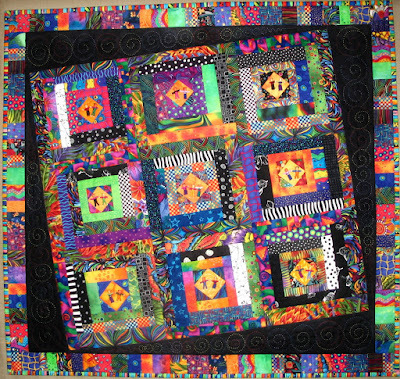 Before I left the world of traditional quilt making, I took enormous pleasure in making quilts with corners that fit exactly and points that were perfect. 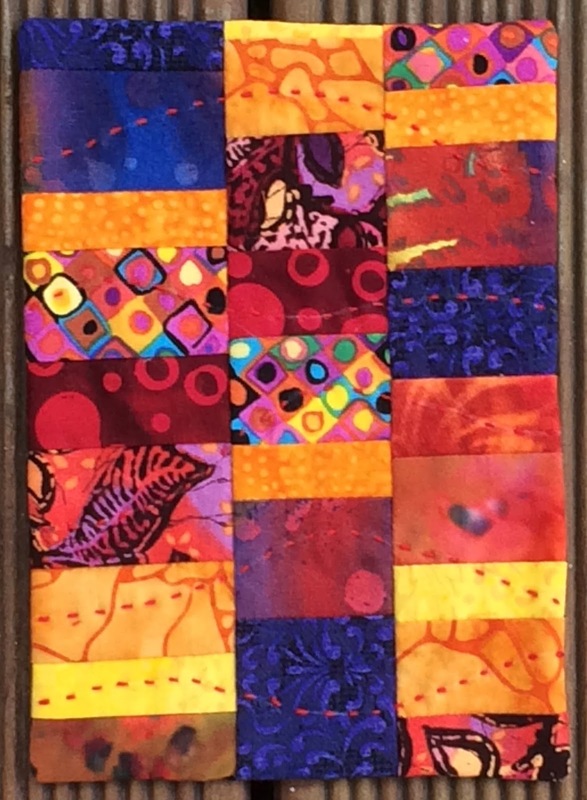 In fact, it was being able to cut out pieces of fabric and sew them together again to make a whole where everything matched that got me into quilting in the first place. We were living in a basement suite in Vancouver at the time, our twin daughters were only months old, and my husband was going to university full-time, and moonlighting as a dishwasher at an extended care facility. I could barely remember which baby needed to be fed next, but knew I needed something to do outside baby care or I would circle down the drain. 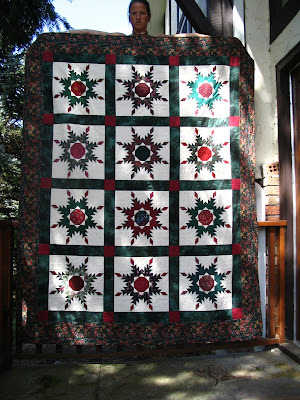 Learning how to make an Ohio Star block felt like some kind of magic in the midst of all this. 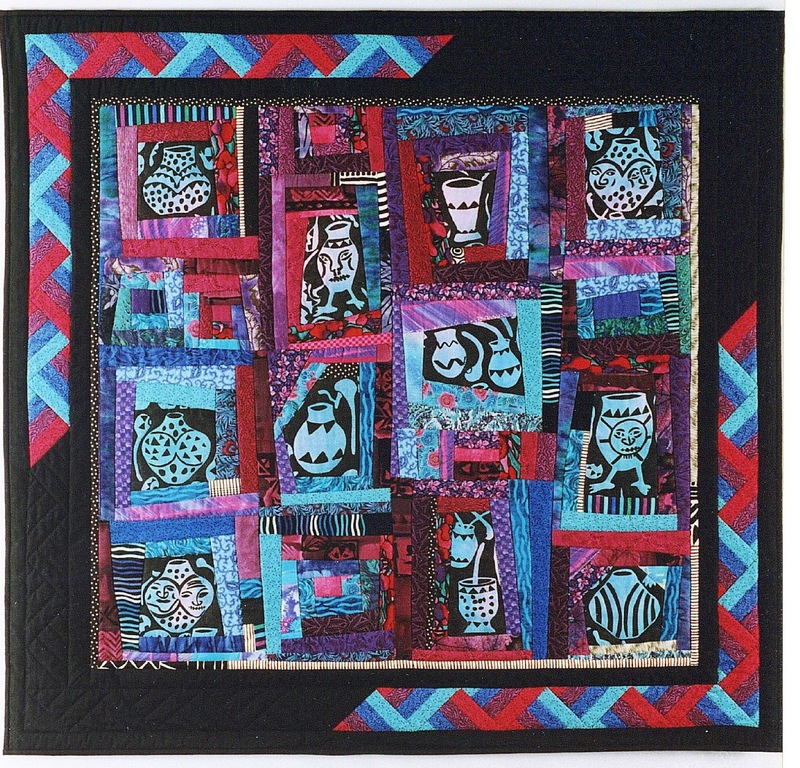 For years and years, I would come back to methodically piecing a quilt whenever my world felt as though it was tipping a little. 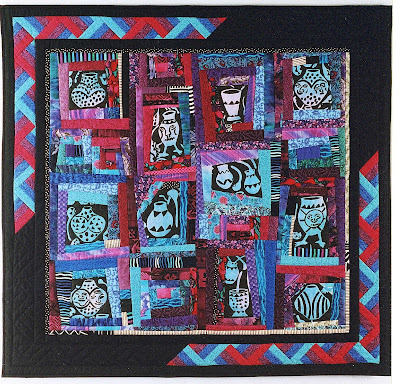 In doing so, I was returning to something made sense to me - making a quilt block - even if I had no idea of how the rest of the pieces of my life were going to fit together. 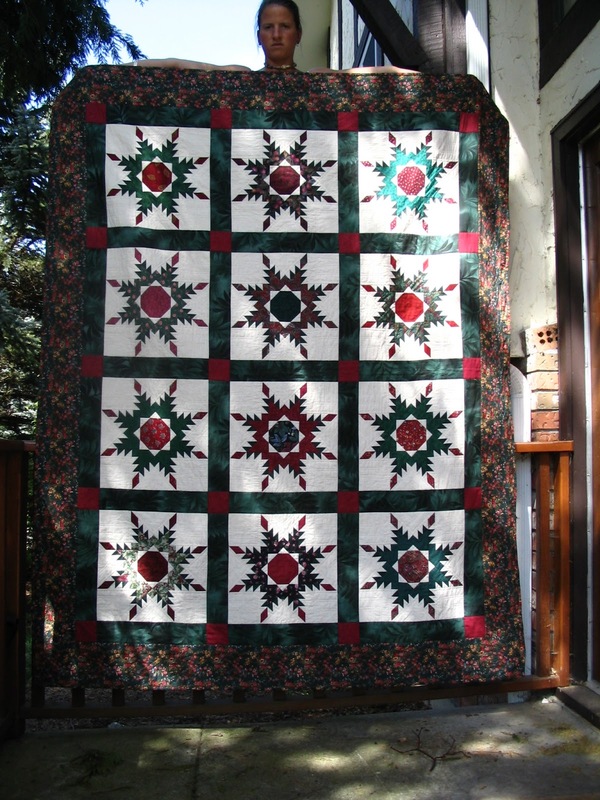 Each of my children was given a traditionally pieced quilt upon graduation - well, maybe a little bit after graduation. Each leave-taking was a time of celebration but also a time of sadness. My world felt off kilter with each child's departure. It realigned itself in time - or healed, to put it another way - and the making of a quilt with exact piecing for each child helped me in the process. In time I moved onto improvisational quilting. Corners and points no longer mattered in the same way, but a cohesive and balanced whole mattered enormously. I began by just tipping the blocks on an angle, and varying the size of the strips of each log cabin. And then in the late 1990's, I took a workshop with Pat Crucil, and that changed everything. The freedom I discovered as I worked intuitively, rather than planning everything out beforehand, was intoxicating. I had been introduced to a new way of working that resonated deeply with me. There were numbers of quilts made in this manner, "The Red Door" being one of the early ones. I discovered that I wasn't only putting the fabric together as I worked, but I was creating a new narrative in the process. My piece made for the FAN exhibit, Ekphrastic, pushed this even further. And it can be seen in works like "Willows", made quite recently. 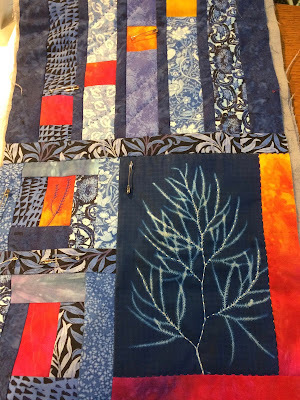 In every instance, every new work, I am taking a number of disparate fragments - cyanotype prints, African indigo prints, strips of assorted fabrics and tiny windows in this case - and putting them together into a new whole. It's restoration work, exactly as Louise Beorgeois describes. 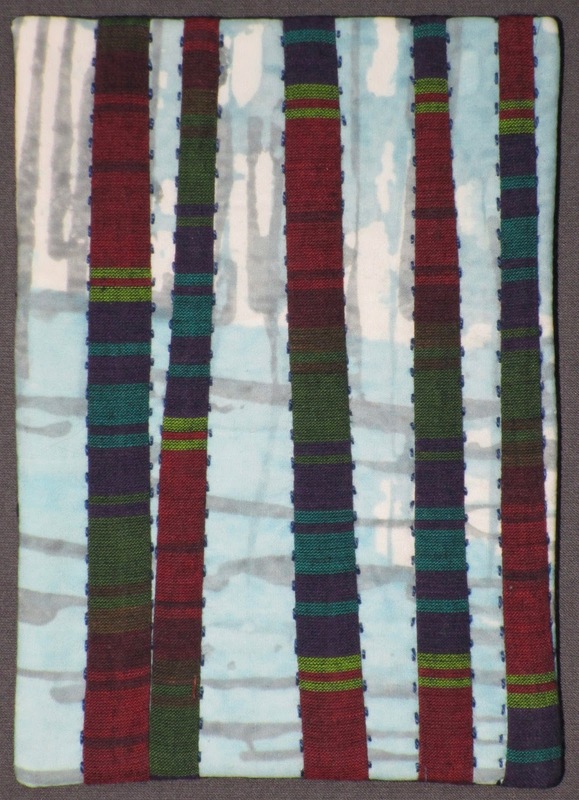 "Fern Walk" was finished just in time to submit it to the Vancouver Island Surface Design exhibit, Pathways. I will hear at the beginning of April whether it's been accepted. But regardless of whether it is or not, I feel pleased with the result, which is part of my series, Field Notes from New Zealand. I do love working with indigo and bright colours, and know there will be new pieces from this series to show you during the course of this year. I've already got my ticket back to New Zealand at the beginning of October, (yay!! ), and my two month stay will include a 10-day artist's residency at the New Zealand Pacific Studio. So exciting! My work there will be to continue with this series, including collecting more ferns, and using cyanotype printing to record their details. And then incorporating them into my work. This is a detail of "Fern Walk", and shows you some of the hand-stitching and the "rocks" that delineate the path. I tried putting real rocks I'd collected on the piece to begin with, but they just didn't look right. And there was the problem of how to attach them without covering over the rock itself. So I appliquéd rocks to the background squares. This week also saw me completing my 8 1/2" x 11" entry to the FAN exhibit, "From a Tiny Seed". When I heard the theme, it made me think about trees, and how the great trees around us here on the west coast all began their lives as a tiny seed. How incredible is that! I know I often think of trees as permanent fixtures, and it's always a shock when I hear of trees that have ended their lives. Just this week, a friend from New Brunswick told me that the giant elms that graced the Officers' Square in Fredericton have almost all come down now. I thought they'd be there forever, and that I could go back and visit them again one day. But they are growing things just like us, and some are just starting their lives, while others are getting older. 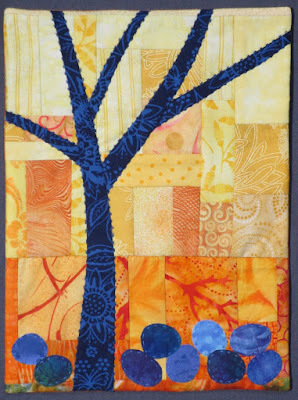 Trees are also a recurring theme in my 100 Day Challenge. I've been trying out different backgrounds in the last couple of weeks, and now I'm longing to make something a little larger. But I must be patient and wait until the Challenge comes to a finish. 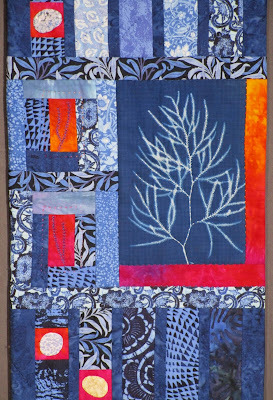 I've already let myself get a little bit behind in finishing "Fern Walk" and "Blue Tree". But I'll soon catch up, and this practice on a small scale has been good for me in many ways. One of the key things, is that I have a clearer idea where I want to head to next. I've had a number of "aha" moments, such as when I realized that I want to return to this my tree series. And that I want to use bright colours in doing so, and that I want to lean towards abstraction in depicting my trees. I'm very happy with my most recent leaves, which have evolved since I first started making them in early January, and I have the sense that they will be included in some new work too. Recently I've been trying out different backgrounds. And different patterns of hand stitching. 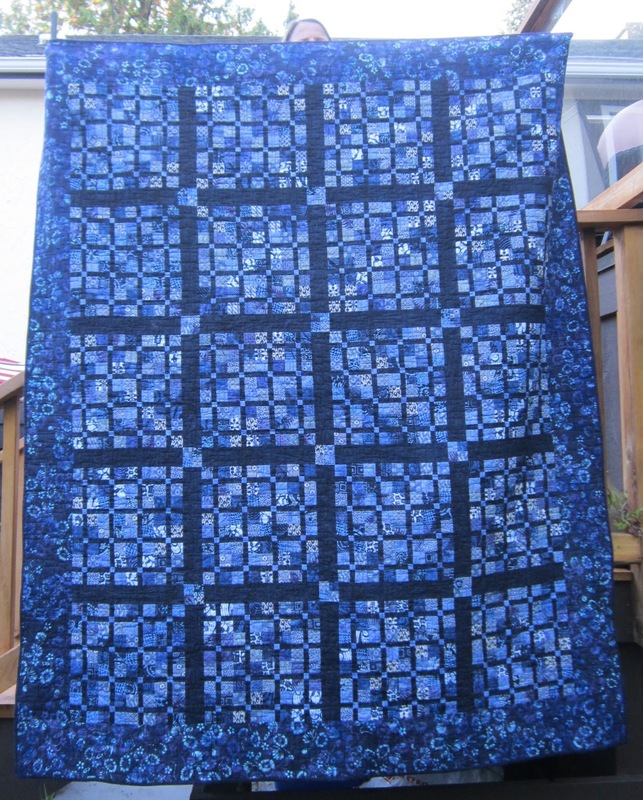 I have enjoyed using perle cotton enormously, and feel pretty sure that I will continue with this too. 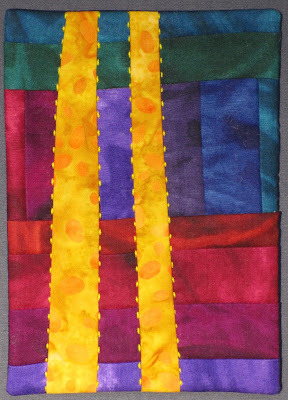 Now I don't feel I've finished something until I've added some hand stitching. Even what shapes are most satisfactory to me has become clearer with time. And interestingly, while windows still intrigue me, they've become less of a focus. Houses too. I think both will be playing supporting roles in what I do next. Of course all of this is open to change, but right now I think this is where I'm heading. But I can only really see far enough ahead to keep moving, and who knows what might be around the next corner. I have been playing with cyanotype printing again. While in New Zealand, I made more prints with ferns and various leaves, and now I'm working on a piece which includes three of these prints. The process itself is most satisfying, using fabric already prepared with the necessary chemicals, and laying the pressed fern on the fabric, holding it in place with a glass plate, and then exposing it to direct sunlight until the prepared fabric becomes a muddy brown. 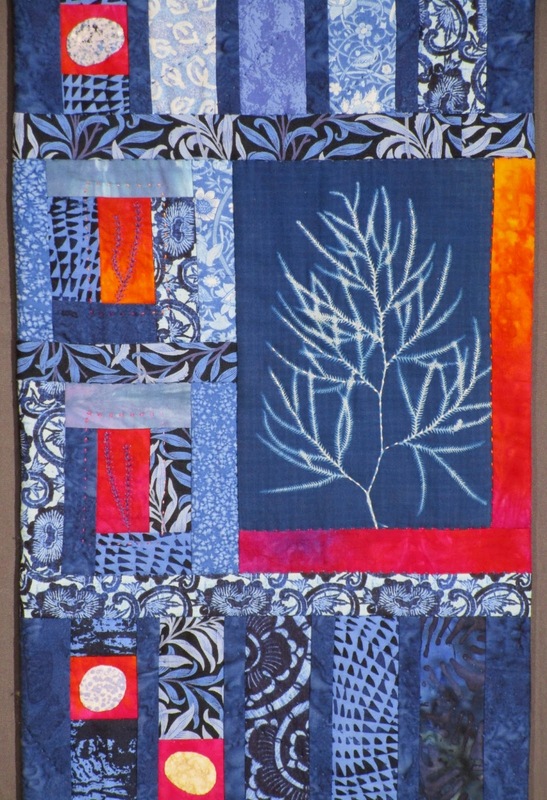 When it's rinsed in cold water and dries in the light, the fabric becomes a rich, dark blue, while the fern or leaf imprint turns a light blue-white. I have used both red and yellow to offset the blue in previous pieces. This time I decided to use a piece of hand-dyed fabric from Ricky Tims, that allowed me to use lighter colours at the top of the piece, and progress to the darkest colours at the bottom of the piece. 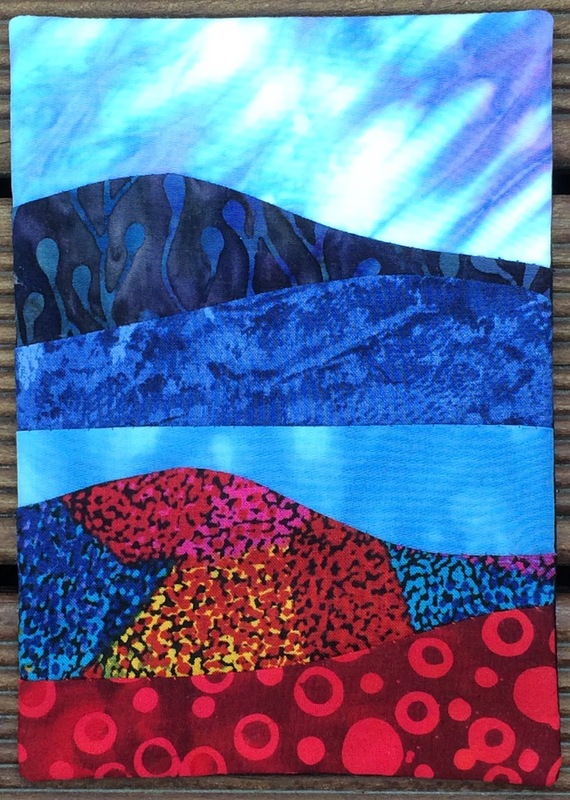 This latest addition to "Field Notes from New Zealand" is being made for an Surface Design Association exhibit, and must measure 12" x 60-72" when completed. This is the portion at the bottom of the work. The fern seems a bit dark in this print, but I will be doing some hand-stitching in off-white to emphasize some of the fronds so hopefully they will show up a little better. With the three focal blocks made, I next needed to work out how to join them together. The theme of the exhibit is "Pathways", so my goal was to create an implied path using a run of the colours used to border the fern prints. 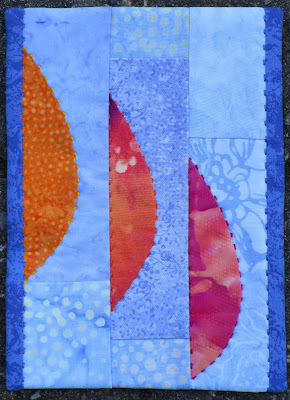 I used strips of blue offset with narrower strips of navy to do this. 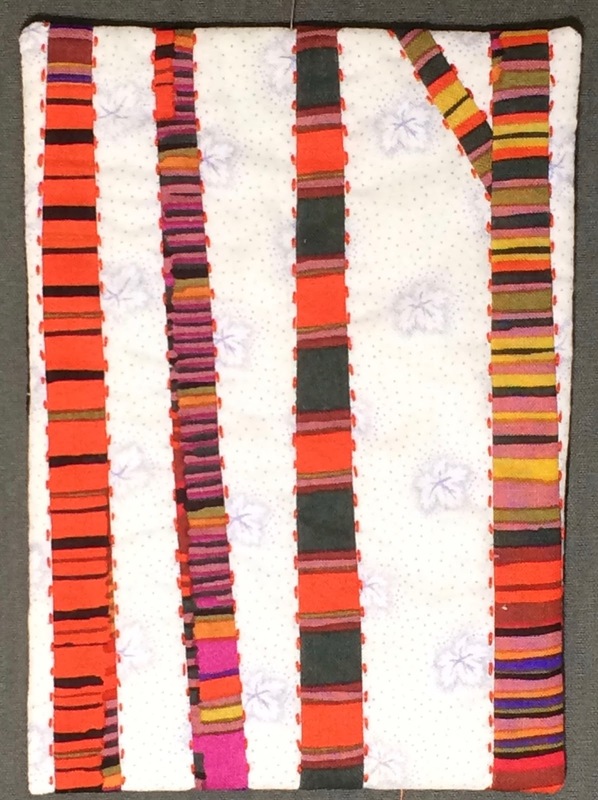 Once I'd joined all the blocks together, I basted it to a reclaimed New Zealand wool blanket - heaven to needle through - and began to add some hand-stitching. Which only leaves the backing and facing to be added. So back to the studio and back to work I must go. I'll be sure to post a photo of the finished work next week! 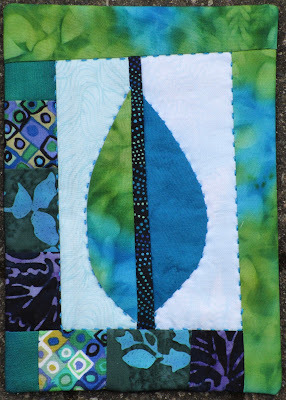 No sooner had I finished writing last week's blog post, than I began to make a small piece, simply called "Roots". 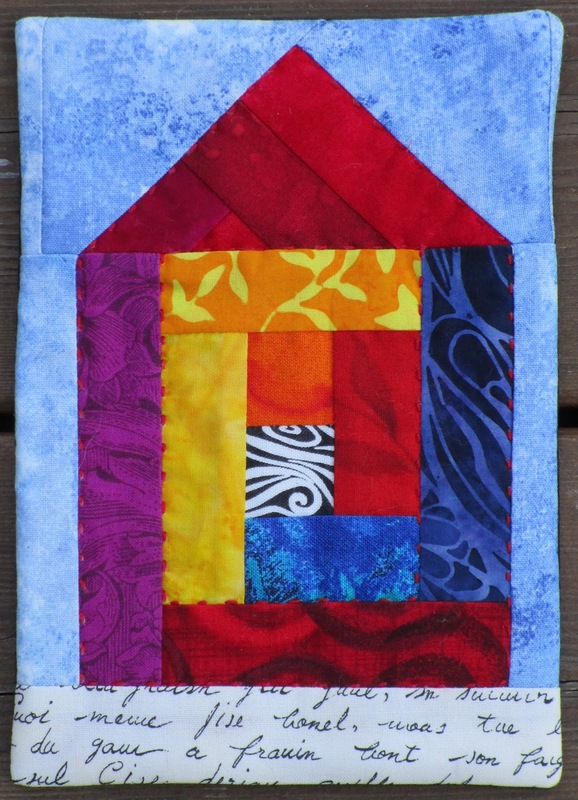 I had been writing about little houses turning up in my 100 Day Challenge pieces, and commented that it was no surprise for someone who moved so many times while she was growing up. How I longed to stay in just one house, to have the same neighbours forever, to have a place to call my own. How I hated it when my father would announce "We're moving to Toronto", or "We're moving to Edmonton", or we're moving to Germany. So yes, little houses have come to symbolize so much for me - most of all, a sense of belonging. 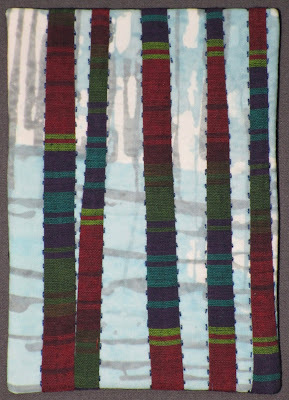 Which got me thinking, why not create a small piece that captures this longing for roots. 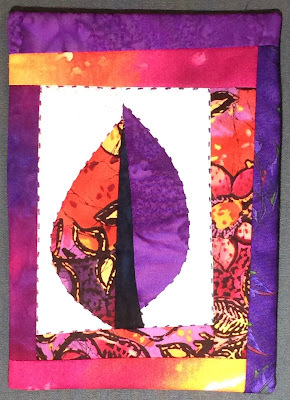 I knew I would be attending a quilting retreat this coming week, which always includes a challenge. 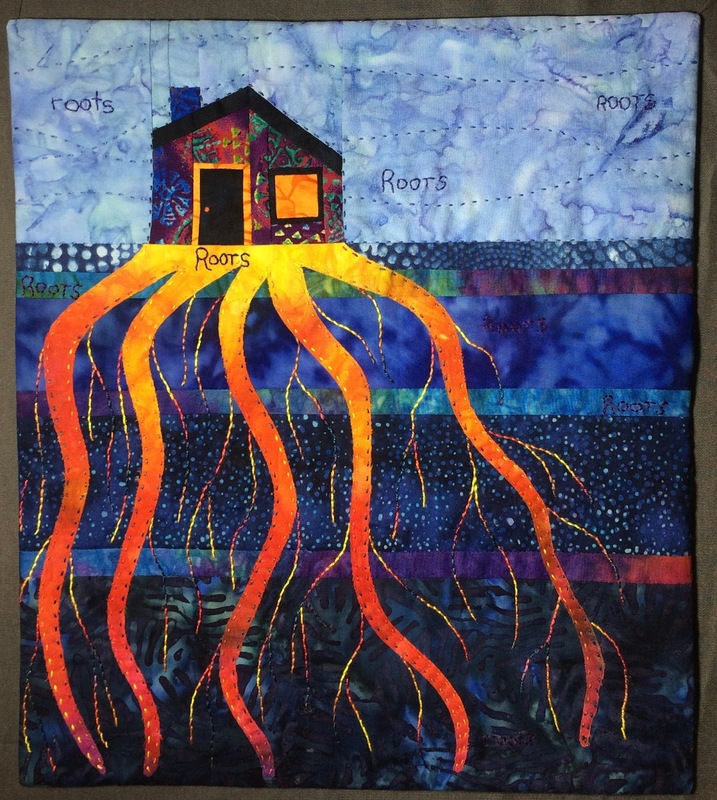 And this year's challenge is to respond to the theme "Roots" - right in line with my meandering thoughts. I often opt out of these challenges, especially if they take me off track from what I'm working on at that time. But this time I thought give it a try. And this was the result. Roots - longing for a place to call my own. No accident, I think, that this little house is a bit like our cabin on Hornby. The irony, of course, is that even if you live in the same place and same house for a very long time, nothing stays the same forever. People who were once counted as friends move away, or perhaps I have moved away mentally, if not literally, from others. Maybe the roots were there all along, and had more to do with being part of the same family through all the moves, and now, having my own family with its own roots. 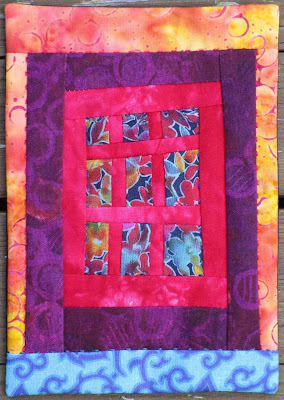 Lots to muse about while I did the hand-stitching. It's not my best work, this piece, but I enjoyed the process, and after all, that's what really matters most. "The only way to become a better artist is to keep on doing the work". So I wrote last week in thinking over what I learned during my online class with Lisa Call. I've been pondering those words a little more in the last week. I think that somewhere deep down, I thought (hoped?) that if only I chose the "right" series to work on, the "right" subject matter, the best techniques and the absolutely most perfect fabrics, that then my work would stand out, and be the best that I could achieve. But the truth is that there is no magic formula that will guarantee success, but only the realization that I need to keep on making, and in time, with a string of both successes and failures behind me, I will get closer and closer to making work that is authentically mine. The 100 Day Challenge is a proving to be a practical-hands-on experience of that very truth. Before I made the first leaf, I agonized about what the 100 pieces should be - should they all be leaves, or all windows, or all trees, or all abstract? 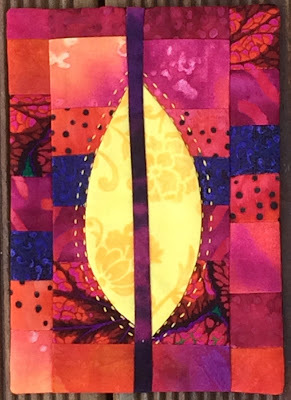 I finally settled on leaves, because I wanted to figure out how to make them using piecing and adding hand-stitching, and because the shapes and varieties and uniqueness of each one are endlessly fascinating to me. I used different colour combinations, and added log cabin borders to them all. Some leaves were more successful than others. I liked the rounded shapes of these better than the skinnier leaves, for example. One day I thought I'd make a tree or two to add to the collection. After all, I thought, leaves and trees are related. And I liked the result, so added more of them from time to time. Sometimes I chose more improbable colours for my leaves, or at least different colours. One day I wondered what would happen if I used a darker background instead of the light background I had used up until then, and then a couple of days later, what would happen if I pieces the trees, rather than using one solid fabric. 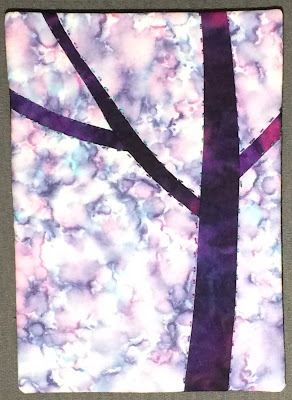 One day I wondered if I could make tree trunks and branches with a gentle curve to them. And somewhere along the way I introduced windows, wondering to myself what it would be like looking out at the forest through the windows, or coming home after a walk through the woods. I realized that I was adding my own stories to each little work. And somewhere along the way I started making little houses. 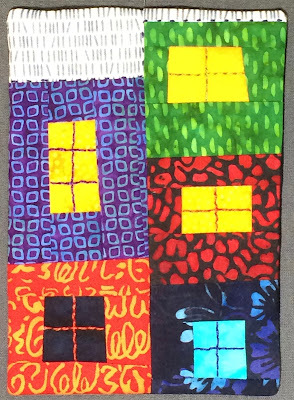 Windows and doors and houses find their way into my work over and over again. 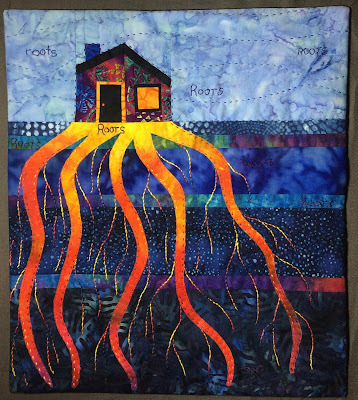 As someone who moved 23 times by the time she was 21, the longing for home and for roots is a huge part of who I am, and here it was appearing in this series of small works. The little house piece also brought me back to my favourite colour palette again. And a few pieces were made then that were abstract play with colour. After all, I reasoned, why not do something a little different, just because it pleased me? Surely that is reason enough. Abstract leaves appeared too. And grey borders - a brief respite from the intense colours I'd been working with for several days. Along with the occasional landscape. And so it goes. 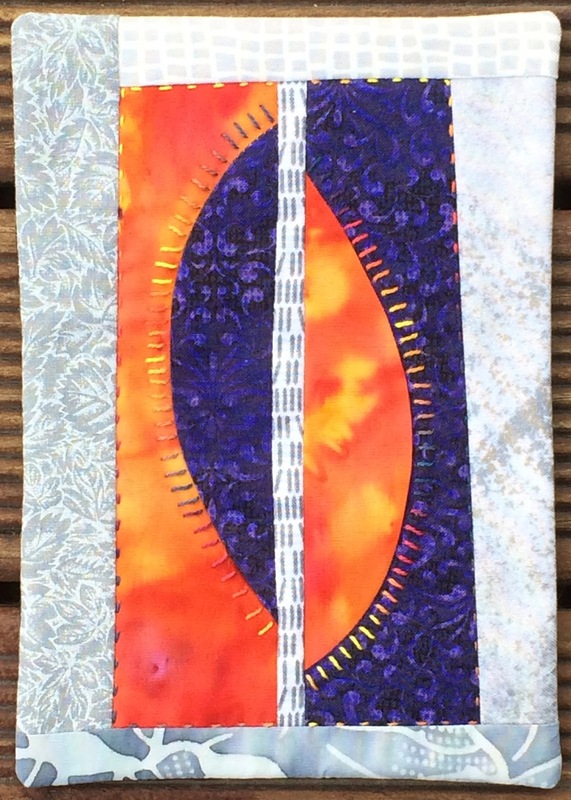 One small 5" x 7" is made and suggests another. Even as I'm making one, I'm wondering to myself, "what if I . . .?" What if I used analogous colours? What if I used a dark background and a light-coloured leaf? 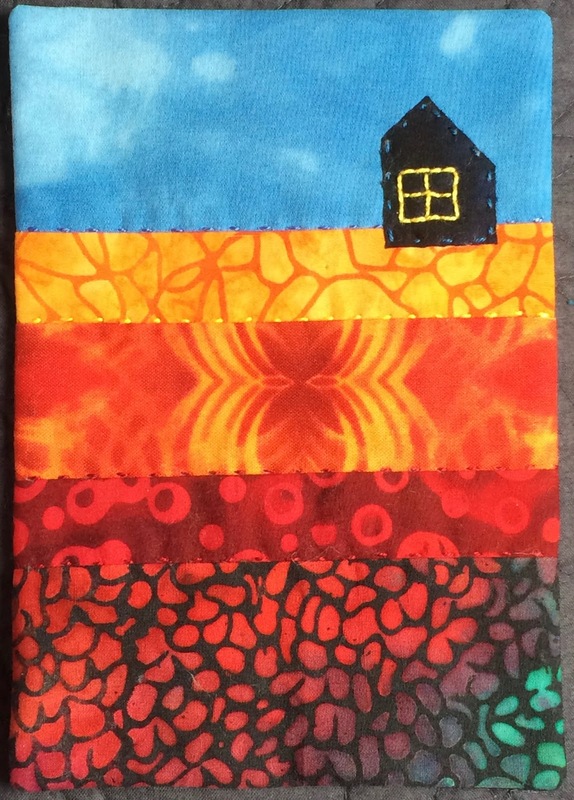 What is I added more or different stitching? What if I used the scraps left from one piece in the next piece? The possibilities are presenting themselves day after day. And so far (Day 58), I haven't run out of ideas. 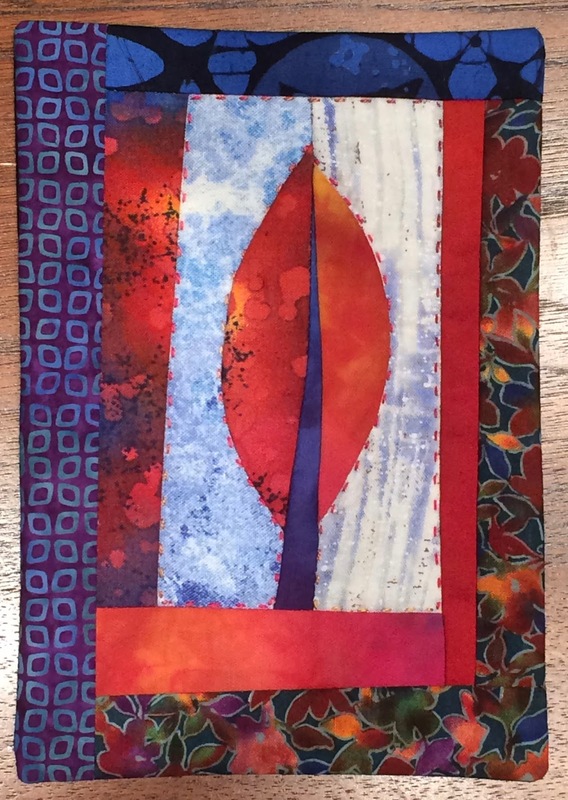 And so the Challenge is proving a wonderful exercise in "Keeping on Doing the Work" - the realization that I don't have to know where all of this is taking me, I just need to keep turning up in the studio and making. Or to put it another way, the process is what matters, and it's OK that I don't know where it will take me. So there is magic in it after all, just not the kind I had been looking for. 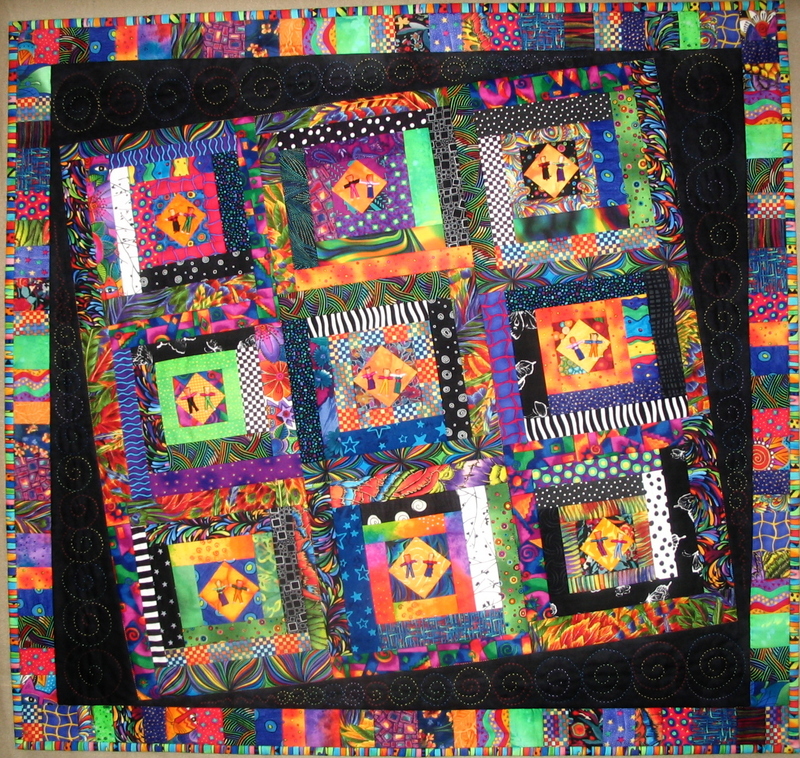 I am a textile artist and quiltmaker, a teacher and a writer. 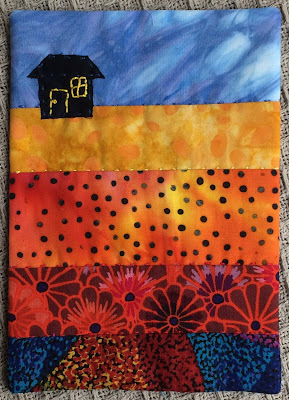 I have been playing with fabric for over 30 years, the last 15 of which have been spent creating original work and teaching design-based classes. 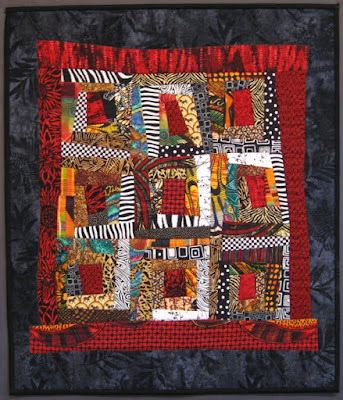 I have a deep connection with the women of Africa, and since 2007 have spent part of each year teaching sewing and quilting to women in Uganda.